So what has to happen to get a saggy ceiling straight? 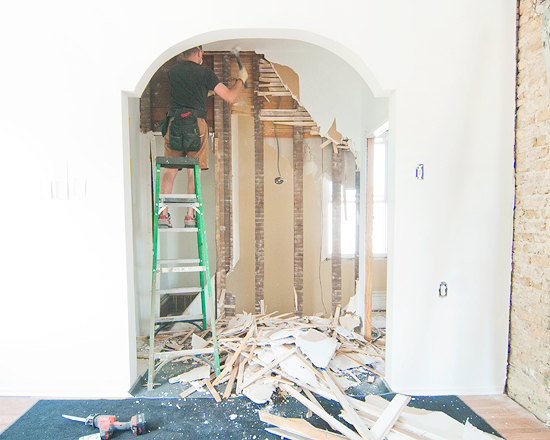 Kim and Scott were a little worried that lifting up the ceiling would cause a wave of other problems, like cracks in the wall or problems with the floor upstairs… I mean, can you really just jack it all up and everything will be fine? All of that stuff IS attached… And when you think about it, it does seem like a lot to move parts of a building around without anything bad happening, but when I was explaining the process to them as I cheered them on to the possibility of doing this job themselves – endlessly optimistic self that I am – I just explained that, as crazy as it seems, as long as you adjust everything slowly, all of the parts (usually) move without any major problems. There might be a few cracks in the walls that you have to patch, but luckily their house ended up being plenty flexible. –phew! 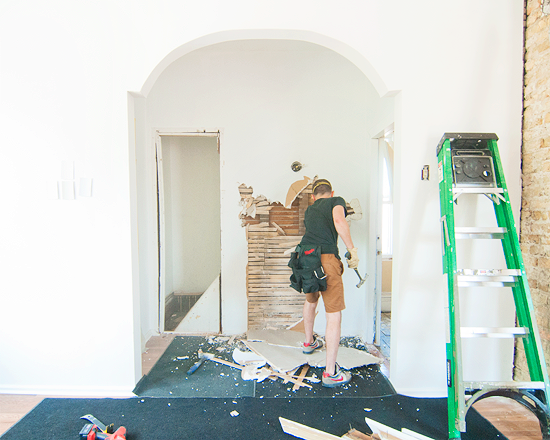 Kim and Scott are amazing and super hands on, so they did all of the demo work and got the space ready for their contractor to come right in and get started lifting the ceiling up. And how might one even do that you ask? 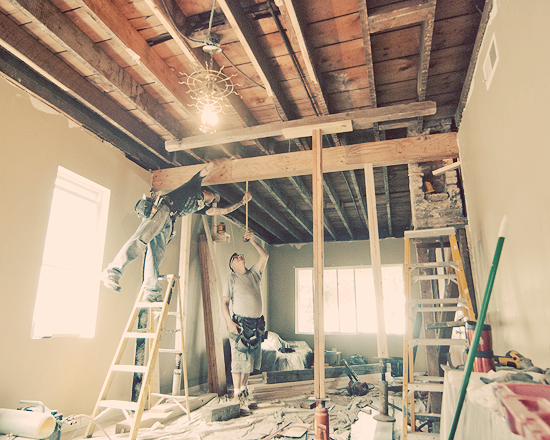 Well, I’ll tell you – first you place a 4×4 at the ceiling on either side of the beam – which needs to run perpendicular and cross all of the sagging joists because you want to be straightening the entire ceiling at once. You use another set of 4×4’s to fit between the ceiling and hydraulic jacks and then, bit by bit, you raise the whole thing back up.. but after each bit you wait for everything to settle into place so that you don’t jerk everything apart and end up with cracked walls and floors above. 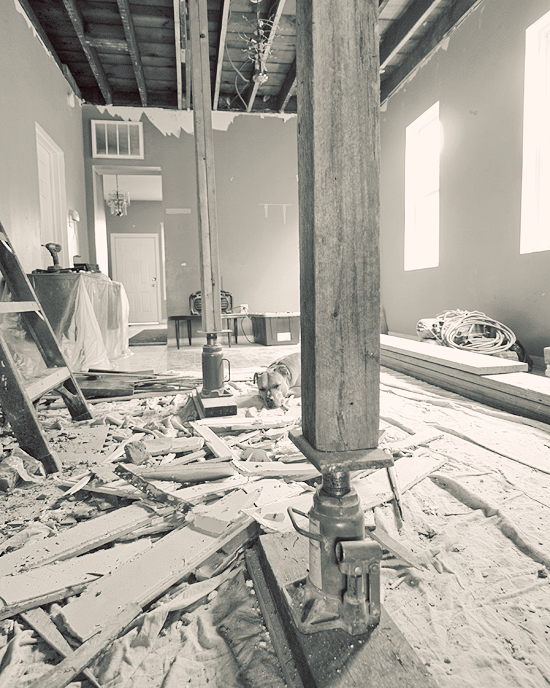 The old beam gets taken out and you lift everything up together… little. by. little. I’d never seen a hydraulic jack before either, thanks guys for finding a saggy ceiling! The column on the chimney side of the room still needs to be beefed up a little before everything is ready to be sealed up again, but it’s getting close! I think by the time all was said and done, the ceiling ended up being lifted back up by about 2.5 or 3′ , pretty impressive if you ask me. 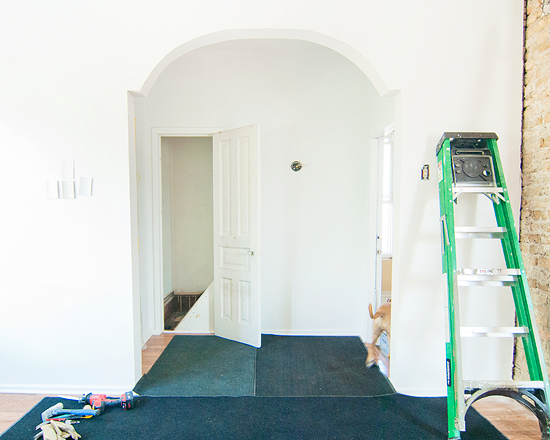 And in the meantime what was transforming upstairs? Kim and Scott decided to go ahead and open up the upstairs entrance now instead of wait. I’m not super patient either, no wonder I love these two! In it’s current state it really felt like two dwellings, just taking out the door upstairs simply wouldn’t do. 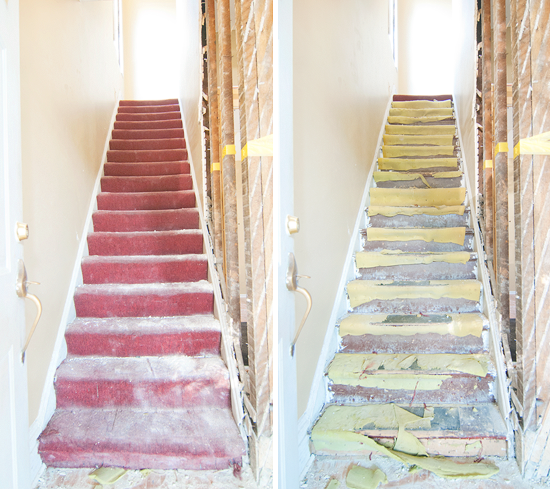 Stairs are always a mystery in a renovation… what’s underneath that horrible carpet? Will you be able to refinish them in wood, or will you have to choose between keeping carpet or completely replacing them? 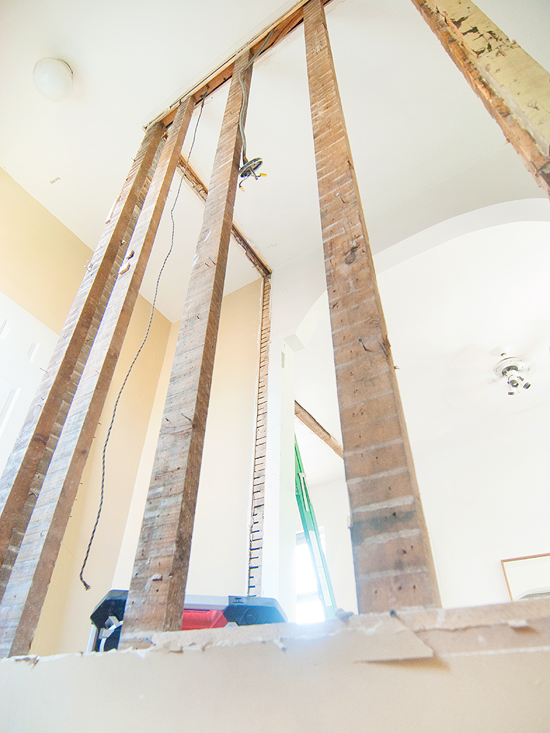 Luckily, for the most part the stairs are in decent shape… another good surprise. They definitely need a lot of TLC… and maybe to be flipped over from the treads being worn down at the front, but it coulda been a lot worse. 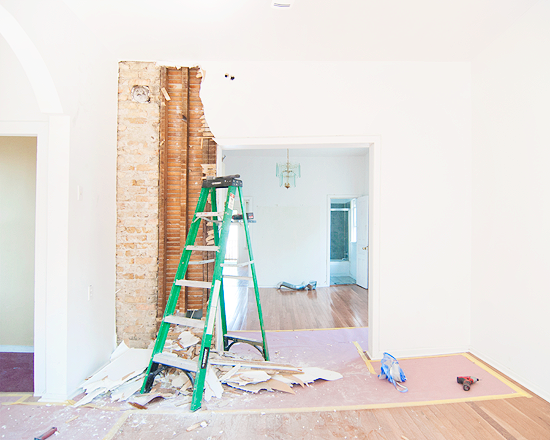 Last but not least, they also wanted to keep the chimney upstairs and leave it exposed (making things downstairs a bit more tricky, brick chimneys are just a little bit heavy)… and open up the two living spaces into one large area – so they jumped right in and tore everything out. 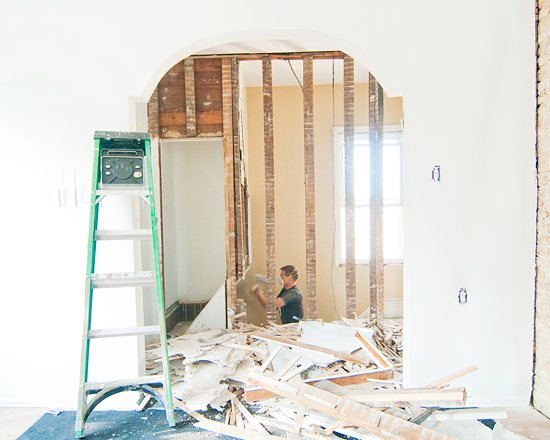 No matter how many renovations I work on I am still amazed by how much of a difference just taking out a wall or two can make. 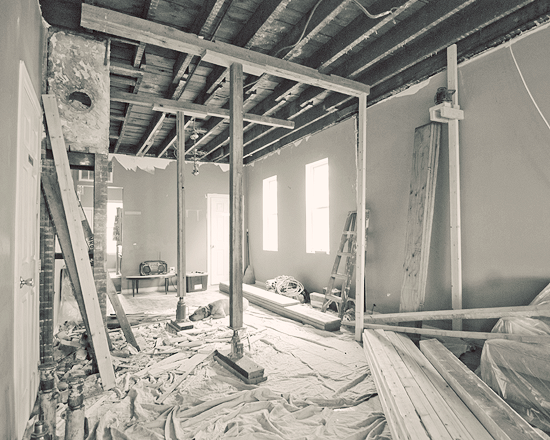 I am always fascinated to see what stayed and what was removed over the years when you dig into an old house. 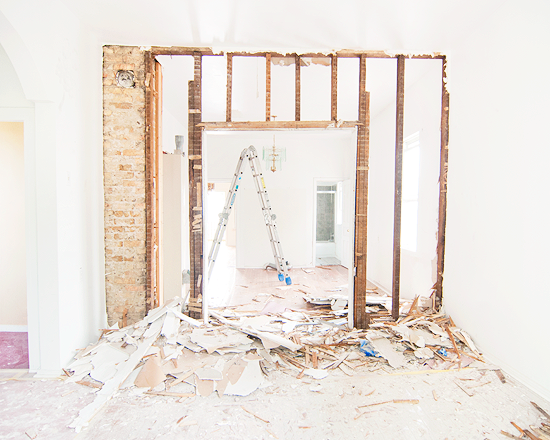 For this place, it seemed that no one was interested in tearing out the plaster and lathe and simply installed gyp board walls over top, making demo even more fun for Kim and Scott. 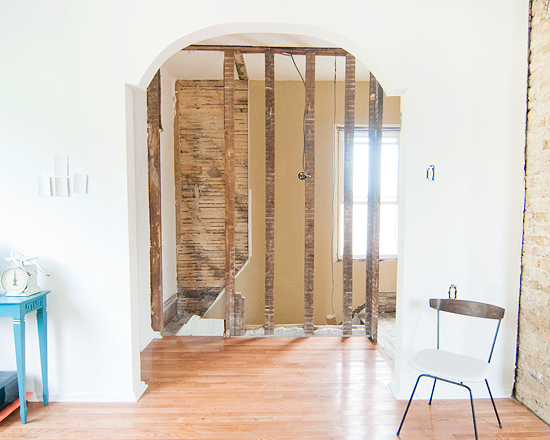 I think every wall and ceiling they tore out was made up of a thousand strips of lathe. Awesome. 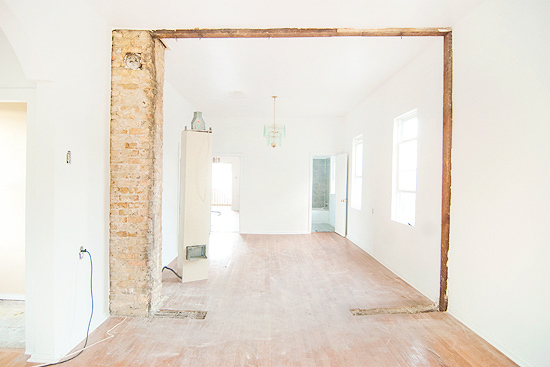 Can’t wait to show you when they wrap up these huge first steps toward transforming their new home. Stay tuned and thanks for reading!